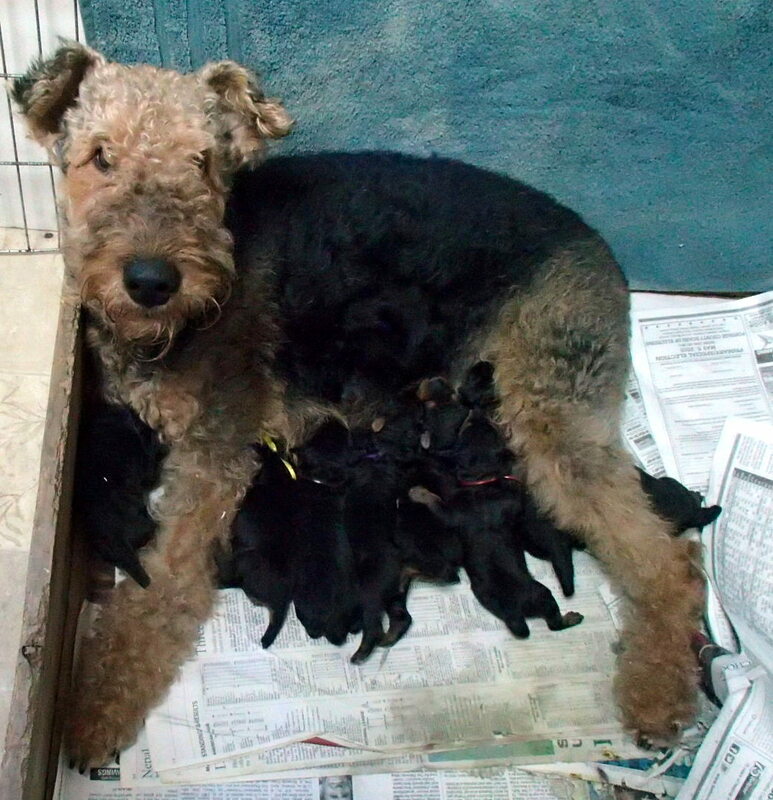 The APU (Airedale Puppies United) is now playing on a bigger field! I put down a great dish of food then ran to get the camera. I came back with it right away but the food had disappeared! Here’s the new soccer field where APU is playing! The cuteness rating has gone through the roof this week! 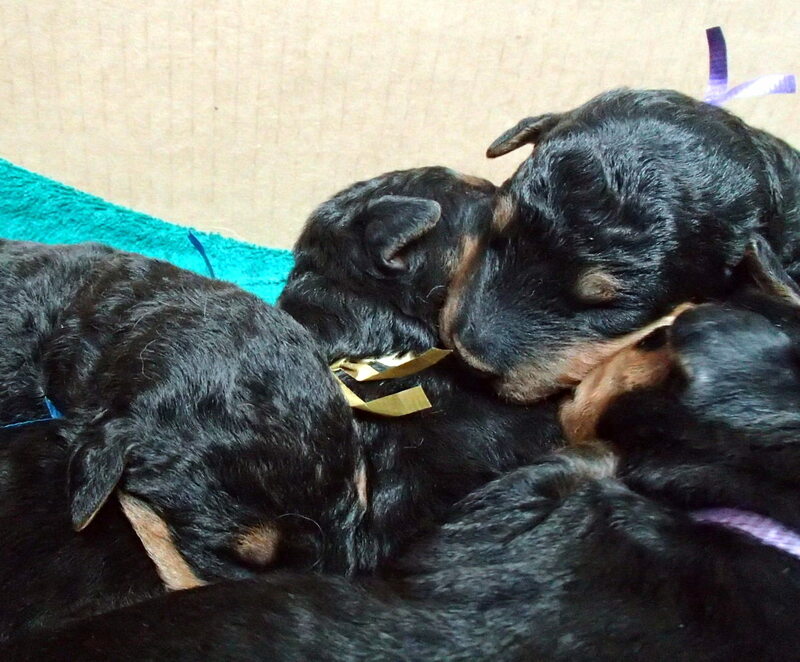 What could be cuter than two puppies that might weigh 2 pounds each tussling with each other? Play has been added the the previous favorites of eating and sleeping. Of course, they have a tendency to decide that Mom should visit them at about 2 am each night and sing a chorus of discontent until she does. You know, these guys are right next to the bedroom, so we know all their moves! 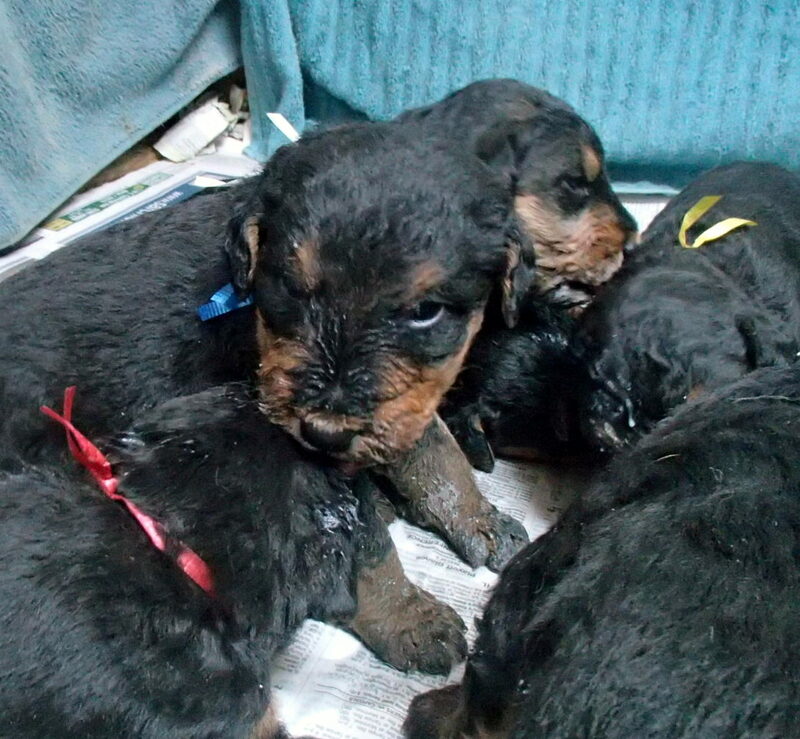 Week Three is also important as they have had the first mild preventative worming medication too. We like to set them up for a great first season! 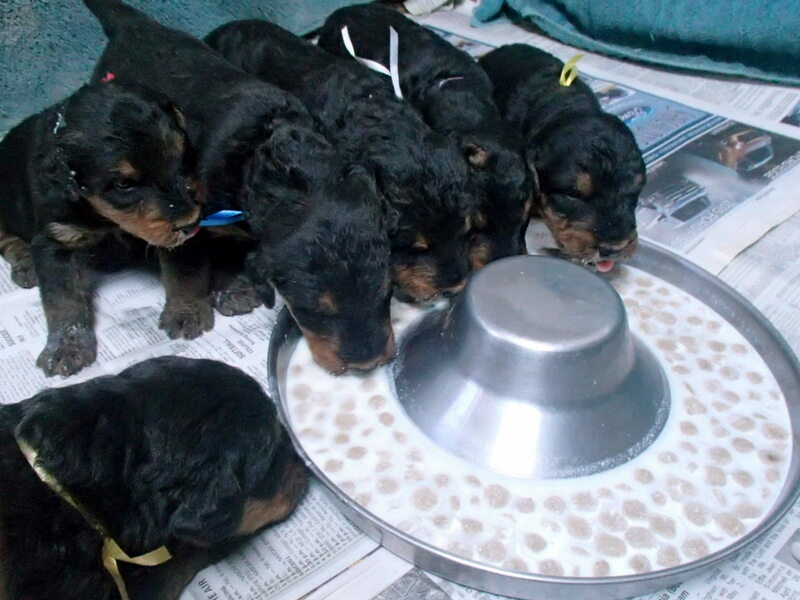 Why is it so important to start food now at 21 days old? Well, consider this: Reddi weighs about 45 pounds and only needs about 3 cups of food per day to take care of her own needs. 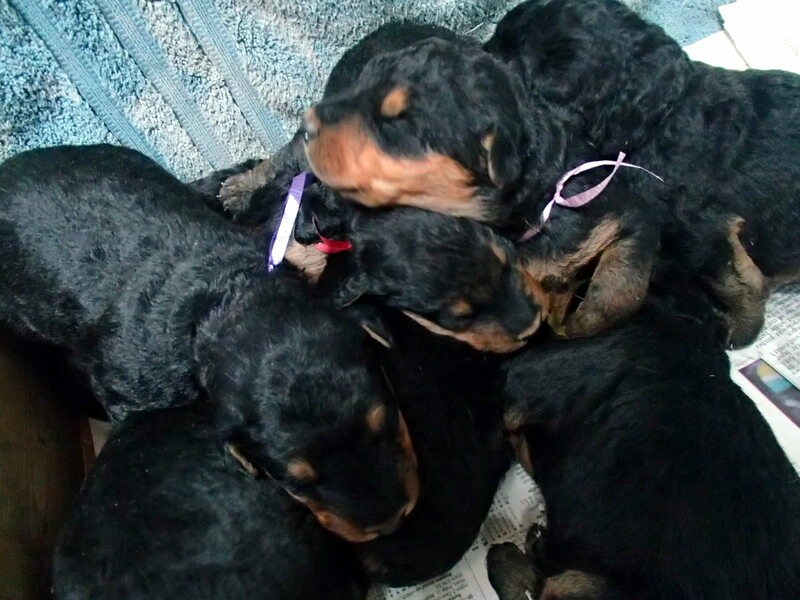 The puppies weigh about 2.5 pounds each and are rapidly gaining. So times the number of puppies gives us more than 20 pounds of puppies, almost half of Reddi’s body weight to support just through milk?!? That’s a lot of milk! Reddi has been eating about 8 cups of densely nutritious foods every day plus drinking more than a gallon of water. The puppies demand just a little more each and every day then they did the day before. So–yes, we’re helping. Reddi sees them a lot and is very very happy to clean up any puppy food they miss! Then she cleans every puppy too! So Much Easier to Lick the Food Off Somebody’s Ear…. Well, doesn’t eight make a team in soccer? I could be wrong about the sports but they do EVERYTHING together. Reddi, the mother is devoted and attentive to them and produces sufficient milk to keep them all happy so far. Very soon they will be so big that Reddi will need some help beyond the high quality Best Breed diet that I have been just about shoveling in to her to keep up with the physical demands that all this mothering requires. In just a few more days, their eyes will open on this big new world. 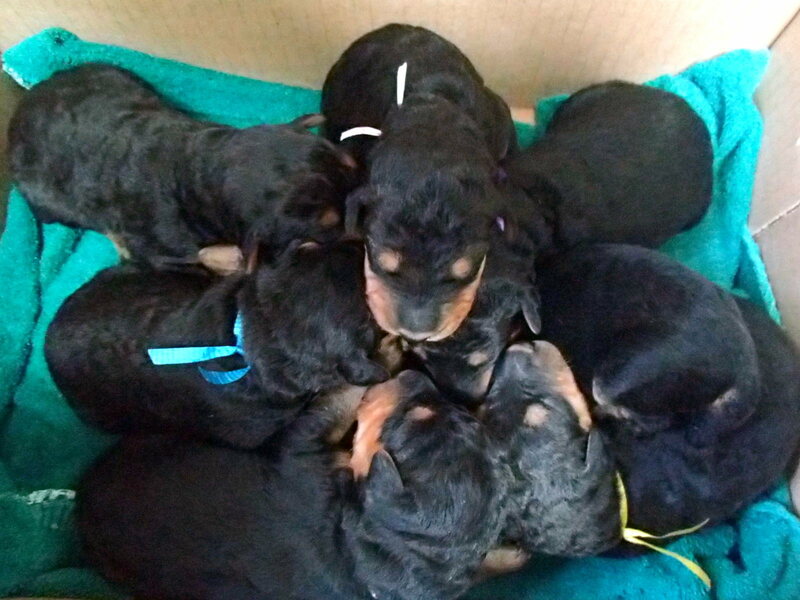 I think puppies are born optimists and it’s up to us not to disappoint them! 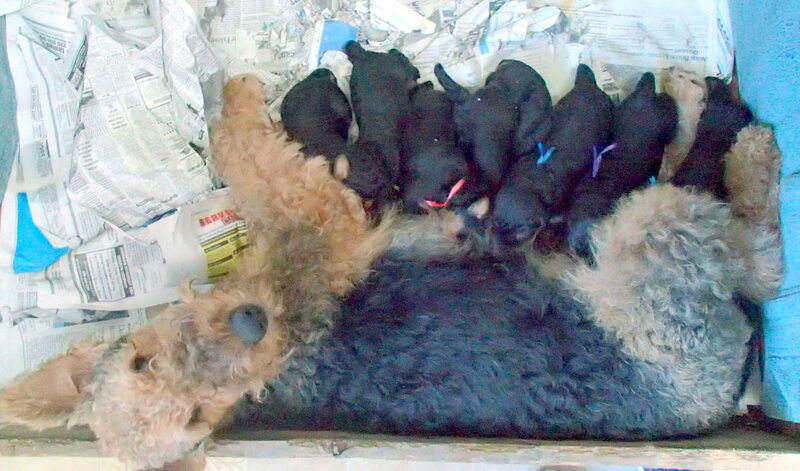 Week One and Puppies Show Big Bellies! 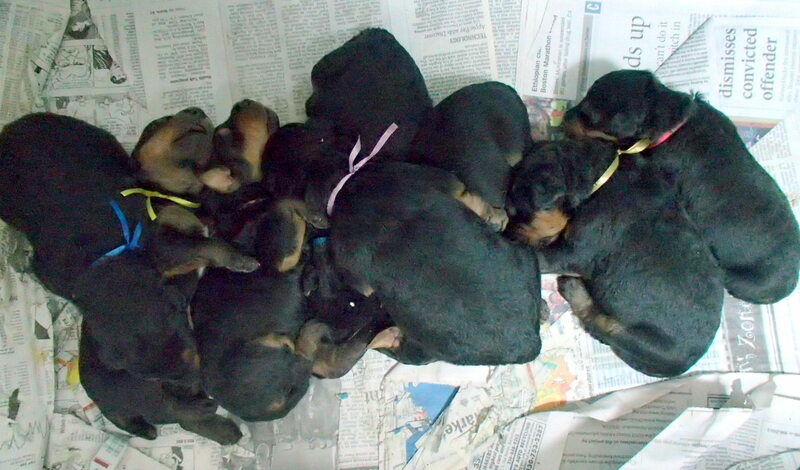 Wonder where the phrase “Pile of Puppies” came from?